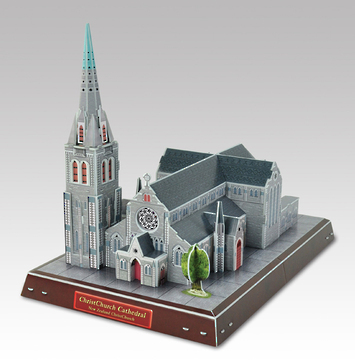 Cubic Fun 3D puzzles are made of paper and expandable polystyrene foam board. Easy to assemble, the pieces slot together with no scissors or glue required. The Anglican Cathedral of Christchurch, New Zealand is located in the centre of the city, surrounded by the Cathedral Square. 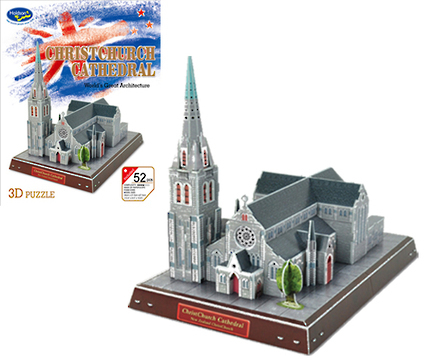 It was built in the second half of the 19th Century when plans from the Canterbury Association aimed to build a city around a central cathedral and college in the Canterbury region based on the English model of the Christ Church Cathedral, Oxford, England. Model Size: 34cm x 21.5cm x 27.5cm. Puzzled.co.nz are completely dedicated to your total satisfaction. If you have any concerns please contact us here. As products are selected they are added to a 'shopping cart'. The shopping cart may be inspected and amended at any time. You will be requested to select a shipping region nearest the delivery destination in order to calculate shipping costs. When ready to 'checkout' you are asked for delivery details then you are passed to PayMate® for secure payment processing on behalf of puzzled.co.nz. Paymate accept both Mastercard and Visa credit cards. All transactions are calculated in New Zealand dollars. On completion of payment you are provided receipting details by Paymate and returned to the puzzled.co.nz website. Puzzled.co.nz will in turn forward full details of your purchase to the email address you supplied. Delivery arrangements will be similarly advised by email. For your security and to enable order tracking you will be provided an order number and a payment transaction ID. Direct overseas orders are not catered for on this site at this time. We do however welcome international orders via direct email contact. Please use the contact form here to place an order. All goods are well packaged for dispatch and forwarded by parcel post or an equivalent courier service to the delivery address provided at the time of purchase. Delivery times will vary upon availability of goods and the delivery destination. Goods will not be dispatched until payment clearance has been verified. Delivery will normally take 3-5 working days within New Zealand from time of purchase. You will be advised by email should any delays be anticipated. We accept returns within 7 days of receipt, or if there is a fault with the items. Please email to advise any problems there are. If faulty we will replace or refund. All returns are at your cost, but replacements are sent free of charge. Puzzled.co.nz do not disclose buyers' information to third parties. No credit card details are retained or handled by puzzled.co.nz. Cookies are used on this shopping site to keep track of the contents of your shopping cart. Once you have completed the purchase or closed the browser all cookies are destroyed. “Our rating” is based on the combination of manufacturer recommendations and personal experience.